Thyroid cancer is the ninth most common cancer in the United States, with an incidence that has been increasing sharply since the mid 1990s. Papillary thyroid carcinoma (PTC) is the most common type, making about 85% of all thyroid cancers. Papillary thyroid carcinoma can occur at any age. The rate of papillary thyroid carcinoma has been increasing in US and in the world. There are only about 12,000 new cases of papillary cancer in the United States each year, comprises about 1% of all cancers and accounts for 0.2% of cancer deaths. Papillary thyroid tumors grow slowly and usually these patients have a long life expectancy. It was estimated that 1 in a 1000 people in the United States have or have had this form of cancer. Papillary thyroid carcinoma tends to grow slowly and to spread first to lymph nodes in the neck. Unlike some other tumors, the generally excellent outlook for papillary cancer is usually not affected by spread of the cancer to the lymph nodes. The most common etiologic factors are radiation exposure, history of thyroid cancer in the family and personal history of thyroid cancer. The widespread use of X-irradiation in the 1950s for treating conditions such as enlarged thymus, hemangiomas, lymphangiomas, enlarged tonsils, adenoids and acne have contributed to the increased incidence of papillary thyroid carcinoma. In survivors of the atomic bomb attacks on Japan at the end of World War II. The Chernobyl nuclear accident in 1986 led to a marked increase in the incidence of papillary thyroid carcinoma in Belarus and other areas of the former Soviet Union close to the accident. And in subjects living in areas near underground and/or underwater as well as above ground nuclear bomb tests were noted. Also in survivors of cancers of various organs whose tumor in the neck or face had been treated with radiation. Most frequently the tumor is discovered accidentally by the patient or physician as a lump in the neck or may be a fortuitous ﬁnding at ultrasound of the neck. It may appear as a gradually enlarging, painful mass with associated symptoms of hoarseness, hoarseness and may be difﬁculty in breathing. Usually there are no symptoms of hyper-or hypothyroidism. Patients with papillary thyroid carcinoma usually present with with a palpable nodule in the thyroid, that is commonly presented as a cold nodule on radioactive iodine scan. Non-palpable nodules of papillary thyroid carcinoma may be discovered incidentally after CT and MRI examination. Small nodules of papillary thyroid carcinoma or microcarcinomas (less than 1 cm in size) are usually of no clinical significance especially in young patients (less than 40 years), since such individuals have a 20-year survival of greater than 98% even with palpable tumors. The disease may be aggressive in children, it is less aggressive in young adults, as compared to patients over age 40. The patient should have a thyroid function evaluation by blood TSH level. Then, if TSH level is normal or high, or patient has a low TSH with a cold nodule on radioactive iodine scan, a fine needle aspiration biopsy (FNAB) of the solitary thyroid nodules should be performed. The best way is to do it under ultrasound guidance and with on site evaluation of the slides by cytologist for an adequacy of the sampling. FNAB of enlarged cervical lymph nodes should also be performed and may reveal a papillary thyroid carcinoma, since patients may present with a palpable cervical LN even when the primary tumor is small or non-palpable. Testing for a specific mutation in the BRAF gene (V600E) is available on thyroid FNA biopsy and after the surgery on pathology specimens. The presence of V600E BRAF mutation has been shown to be associated with multiple features of aggressive papillary thyroid carcinoma, such as local invasion, lymph node metastasis, multifocality, extra thyroidal extension, distant metastases,and even worsening the survival. 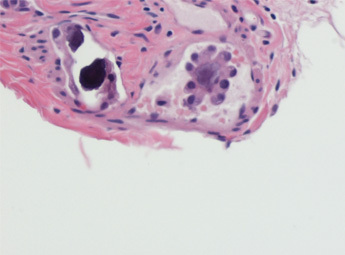 Because of an increased risk for malignancy, the American Thyroid Association (ATA) has recommended total thyroidectomy in patients with indeterminate nodules who have large tumors (bigger than 4 cm), when marked atypia is seen on biopsy, when the biopsy reading is ‘‘suspicious for papillary carcinoma,’’ in patients with a family history of thyroid carcinoma, and in patients with a history of radiation exposure. For patients with thyroid cancer >1 cm, the initial surgical procedure should be a near-total or total thyroidectomy unless there are contraindications to this surgery. Thyroid lobectomy alone may be sufficient treatment for small (less than 1 cm), low-risk, unifocal, intrathyroidal papillary carcinomas in the absence of prior head and neck irradiation or radiologically or clinically involved cervical nodal metastases. Therapeutic central-compartment (level VI) neck dissection for patients with clinically involved central or lateral neck lymph nodes should accompany total thyroidectomy to provide clearance of disease from the central neck. Prophylactic central-compartment neck dissection (ipsilateral or bilateral) may be performed in patients with papillary thyroid carcinoma with clinically uninvolved central neck lymph nodes, especially for advanced primary tumors (T3 or T4). Near-total or total thyroidectomy without prophylactic central neck dissection may be appropriate for small (T1 or T2), noninvasive, clinically node-negative papillary thyroid carcinomas and most follicular cancer. Therapeutic lateral neck compartmental lymph node dissection should be performed for patients with biopsy proven metastatic lateral cervical lymphadenopathy. Completion thyroidectomy should be offered to those patients for whom a near-total or total thyroidectomy would have been recommended had the diagnosis been available before the initial surgery. This includes all patients with thyroid cancer except those with small (less than 1 cm), unifocal, intrathyroidal, node-negative, low-risk tumors. Therapeutic central neck lymph node dissection should be included if the lymph nodes are clinically involved. Thyroid cancers are divided into low-, intermediate-, and high-risk groups. The prognostic features: age, gender, size, grade, extrathyroidal extension, and completeness of resection. Surgical treatment should adhere to the risk-group analysis. Extrathyroidal extension - extra attention to remove all gross tumor during the initial surgical procedure to avoid future recurrences. Nodal metastasis - minimal implications; however, in older patients and poorly differentiated histology - major implications. Grading is important, especially for poorly differentiated, tall and insular cell variants - do not respond well to RAI, follow-up with a PET scan. Overall survival with well-differentiated thyroid cancer > 95%. There are following subtypes of papillary thyroid carcinoma: classic variant, follicular variant, tall cell variant, diffuse sclerosis variant, columnar cell variant, solid variant, insular variant, and poorly differentiated variant. Figures 1 and 2: Show a low and high power view of the papillary carcinoma, classic variant, the high power showing the classic nuclear features. Figure 3 shows intralymphatic plugging by papillary carcinoma with psammoma bodies the lymphatics extending into the lymph node on the side of the thyroid. Figure 4 shows the small follicles within the lymph node. 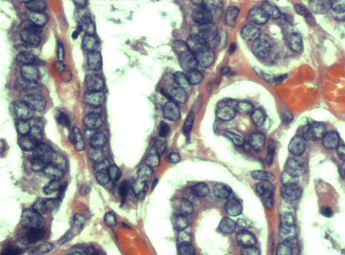 Figures 1 and 2: papillary carcinoma classic variant, low and high power view, the high power view showing the classic nuclear features (nuclei with chromatin clearing and nuclear grooves). 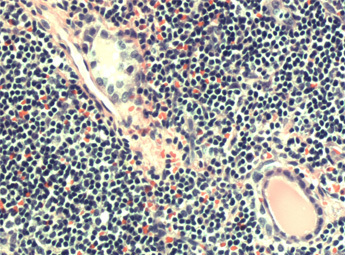 Figure 3 intralymphatic plugging by papillary thyroid carcinoma with psammoma bodies the lymphatics extending into the lymph node on the side of the thyroid. Figure 4 the small follicles of micrometastases of papillary thyroid carcinoma within the lymph node..
Low-risk patients have the following characteristics: 1) no local or distant metastases; 2) all macroscopic tumor has been resected; 3) there is no tumor invasion of locoregional tissues or structures; 4) the tumor does not have aggressive histology (e.g., tall cell, insular, columnar cell carcinoma) or vascular invasion; 5) and, if I-131 is given, there is no I-131 uptake outside the thyroid bed on the first post treatment whole-body RAI scan (RxWBS). Intermediate-risk patients have any of the following: 1) microscopic invasion of tumor into the perithyroidal soft tissues at initial surgery; 2) cervical lymph node metastases or I-131 uptake outside the thyroid bed on the RxWBS done after thyroid remnant ablation; or 3) tumor with aggressive histology or vascular invasion. High-risk patients have 1) macroscopic tumor invasion, 2) incomplete tumor resection, 3) distant metastases, and possibly 4) thyroglobulinemia out of proportion to what is seen on the post treatment scan. RAI ablation is recommended for all patients with known distant metastases, gross extrathyroidal extension of the tumor regardless of tumor size, or primary tumor size bigger than 4 cm even in the absence of other higher risk features. It is also is recommended for selected patients with 1–4cm thyroid cancers confined to the thyroid, who have documented lymph node metastases, or other higher risk features (see preceding paragraphs) when the combination of age, tumor size, lymph node status, and individual histology predicts an intermediate to high risk of recurrence or death from thyroid cancer. Patients undergoing RAI therapy or diagnostic testing can be prepared by LT4 withdrawal for at least 2–3 weeks or LT3 treatment for 2–4 weeks and LT3 withdrawal for 2 weeks with measurement of serum TSH to determine timing of testing or therapy (TSH more than 30mU/L). Thyroxine therapy (with or without LT3 for 7–10 days) may be resumed on the second or third day after RAI administration. Remnant ablation can be performed following thyroxine withdrawal or rhTSH stimulation (Thyrogen). RAI ablation is not recommended for patients with unifocal cancer less than 1 cm without other higher risk features. RAI ablation is not recommended for patients with multifocal cancer when all foci are less than 1 cm in the absence other higher risk features. A low-iodine diet for 1–2 weeks is recommended for patients undergoing RAI remnant ablation, particularly for those patients with high iodine intake. Initial TSH suppression to below 0.1mU/L is recommended for high-risk and intermediate-risk thyroid cancer patients, while maintenance of the TSH at or slightly below the lower limit of normal (0.1–0.5mU/L) is appropriate for low-risk patients. Similar recommendations apply to low-risk patients who have not undergone remnant ablation, i.e., serum TSH 0.1–0.5mU/L. Papillary thyroid cancer has an excellent prognosis, with 5-year survival rates of 98%. However, for the 7% of individuals with aggressive papillary thyroid carcinoma, the natural history is unpredictable and additional therapeutic options are limited. If you have an overactive thyroid gland or have been diagnosed with thyroid cancer, you endocrinologist may prescribe radioative iodine (radioiodine) as a part of your overall treatment. The two most common types of thyroid cancer (papillary and follicular) can usually be treated with radioiodine because the cells are able to take up some iodine. Radioiodine is usually administered after the removal of the thyroid. 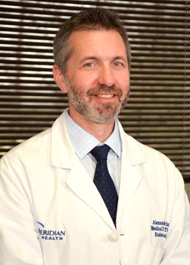 An experienced thyroid surgeon can remove most of the thyroid with a very low risk of surgical complications. In many cases, surgery followed by thyroid hormone therapy is sufficient to treat thyroid cancer. When it may not be sufficient, radioiodine can be used to destroy the remainder of the gland, which might harbor additional microscopic clusters of the thyroid cancer. In that case, you may be advised not to use thyroid hormone replacement for several weeks after the operation in order to allow the thryoid levels to drop below normal. This will lead to maximal stimulation of the remaining thyroid cells to concentrate iodine and be destroyed when you recieve a dose of radioiodine. This treatment significantly reduces the possibility of recurrent cancer and also improves the ability to detect and treat future cancer recurrences that might develop. Chen AY, Jemal A, Ward EM. Increasing incidence of differentiated thyroid cancer in the United States, 1988-2005. Cancer. 2009;115(16):3801-3807. National Cancer Institute. SEER Cancer Statistics Review 1975-2009, 12, 2013. Mod Pathol. 2011 Apr;24 Suppl 2:S1-9. Papillary thyroid carcinoma: an update. LiVolsi VA.
Lloyd RV, Buehler D, Khanafshar E. Head Neck Pathol. 2011 Mar;5(1):51-6. Papillary thyroid carcinoma variants. Hay ID. Management of patients with low-risk papillary thyroid carcinoma. Endocr Pract. 2007 Sep;13(5):521-33. Mazzaferri EL. Management of low-risk differentiated thyroid cancer. Endocr Pract. 2007 Sep;13(5):498-512. Shaha A. Ann N Y Acad Sci. 2008 Sep;1138:58-64. Xing M, Alzahrani AS, Carson KA, et al. Association between BRAF V600E mutation and mortality in patients with papillary thyroid cancer. JAMA. 2013; 309(14):1493-1501. 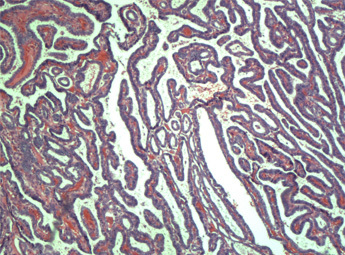 Xing M. BRAF mutation in papillary thyroid cancer: pathogenic role, molecular bases, and clinical implications. Endocr Rev. 2007;28(7):742-762. Howell GM, Carty SE, Armstrong MJ, et al. Both BRAF V600E mutation and older age (65 years) are associated with recurrent papillary thyroid cancer. Ann Surg Oncol. 2011;18(13):3566-3571. Higher Body-Mass Index and Higher Percentage of Body Fat Are Associated with Increased Papillary Thyroid Cancer Risk, by Xu L. Clin Thyroidol 2014;26:90–92.